The PRG experience is a blend of exciting fishing, unreal scenery, interesting foods, and great service. It is our desire to share an authentic Argentine experience with you while not allowing the “mañana culture” to influence your trip in any way. We work hard – a year out – to ensure that your trip is well prepared and executed, and so that we can deliver the highest quality experience. To fully enjoy the PRG experience we encourage our guests to look around and explore the culture, drink mate, learn a few Spanish words, laugh a lot and find out what Patagonia is all about. Our guides are fun to be with, local experts, and proud to share their beautiful country with you – the type of guides you want to fish with. Anglers come to Patagonia for many different reasons but almost all find out that just getting to the rivers offers an incredible experience. It is not uncommon to see gauchos moving cattle and sheep or local farmers working with oxen. Bizarre birds like pink flamingos, rheas, ibis, parrots, and even condors passing overhead in wide valleys. Just being in Patagonia is truly a very special part of the trip, and the PRG experience is more than just fishing. 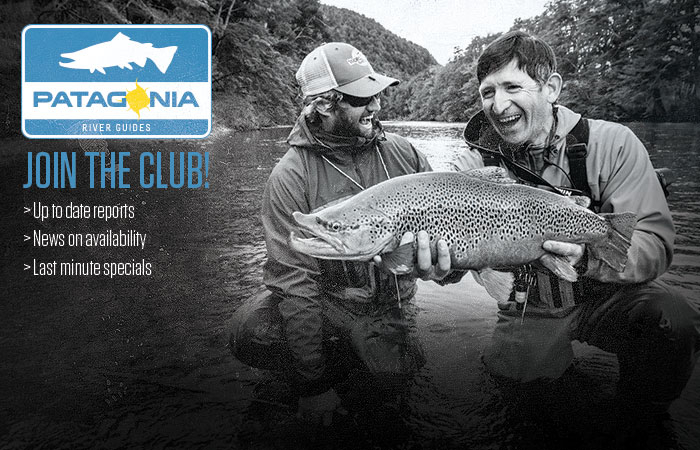 Guests that fish with us frequently, know that our company culture, our program, and our approach to pleasing is distinct and unlike any other operation. Along with beautiful wild trout, we’ll show you fabulous flora and fauna, amazing off-the-beaten path places, introduce you to a warm and welcoming culture, and help you take a break from any stress you might have back home. ITS EASY TO BOOK YOUR TRIP! Travel to Patagonia is easy, and we have made it easier yet by offering a friendly and talented travel team to assist you with booking your trip and to get you to and from our fishing lodges safely and efficiently. Traveling to Argentina is a breeze from the USA requiring just an overnight flight and a short 2-hour connection to Patagonia from Buenos Aires. Many find it takes the same, if not less, time than traveling to Alaska or Montana. Upon booking your trip, we will provide each guest with the best pre-trip travel package in the business and connect you with our logistic specialists working from our base of operations. Our recommendations don’t cost you a penny extra and our only motivation in recommending them is to give our guests the absolute best service. Booking direct with PRG prevents any confusions, repetitive emails, and misinformation, and by eliminating the middle man, we make sure you are getting the right information in a timely manner ensuring your booking goes smoothly. Guests typically depart in the evening from their departure city on direct flights to Buenos Aires from six major US cities and dozens of cities world-wide. The flight time is typically nine hours and guests able to sleep well on planes wakeup in Buenos Aires the next day. Guests clear immigration and customs at the international airport and take a short transfer to the Buenos Aires domestic airport to catch their flight to Patagonia. Three Patagonian cities receive direct flights (about two hours in duration) from Buenos Aires. With proper planning and assistance from our travel professionals, lodges are typically within thirty minutes to an hour from the airport. Should I stay overnight in Buenos Aires? Some of our guests choose to enjoy a night or two in Buenos Aires to shake off any jet lag (which is little since Argentina is only one hour ahead of east coast time), and to enjoy an interesting and friendly cultural experience in the “Paris” of South America. If you just want to go fishing, there is no problem and we’ll make sure that you can arrive and depart without staying in the city, but you should rely on our agents to ensure you have proper connections and assistance should you have any unforeseen problems along the way. What is the average time doorstep to doorstep? From most locations in the USA, you will be sampling malbec wine and ready to eat delicious beef in less than 20-hours. From your international airport to our lodges, it usually takes about 15-hours. You just have to add your local connection to Houston, Dallas, Miami, Atlanta, NYC, or Newark. Traveling to Montana, British Columbia, or Alaska takes almost as long as going to Argentina and in some cases longer. What is the average flight price? International air typically costs between $600 to $1000 and domestic flights average $500 per passenger. I like to do things on my own, is this recommended? We recommend that you use our agents for your first trip to Argentina so that you can relax and completely enjoy the experience. If you want to do it on your own, our pre-trip info package provides the information necessary. What can your agents help me with? Complete flight bookings, transfers, airport assistance, hotel reservations, dinner reservations, city tours, lost luggage assistance, upgrades, extended stays, currency exchange, and concierge service while in Buenos Aires. Contact us and we’ll provide a detailed schedule, provide you with pre-trip information, and connect you with our travel professionals.